Flash floods are uncommon here–I always think of the desert southwest, and waves of mud and debris sloshing through arroyos. No arroyos in the Cascades. But about two weeks ago, a powerful thunderstorm parked itself over the Teanaway and cut loose. The rain came down suddenly and hard. Parts of the mountains slid down with the water. Tons of rock were rearranged in a short time. What’s so interesting is that the places that slid are avalanche chutes in the winter. The angle of the slopes are perfect for sliding, whether it’s snow or rocks that come down. In some places, the chutes are scoured down to bedrock. 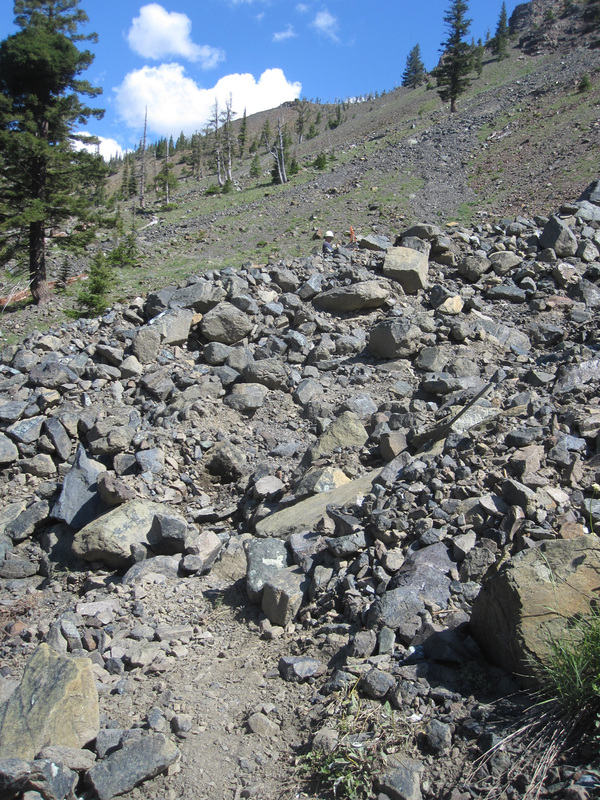 In other places, Piles of shiny dark Teanaway scree are deposited. In Bean Creek, the high watermark is several feet above the normal summer flow. Streamside alders were stripped of bark and leaves, and stand bleaching in the sun like bones. Yesterday I scouted up Beverly Creek, and found nearly a quarter of a mile of trail affected. 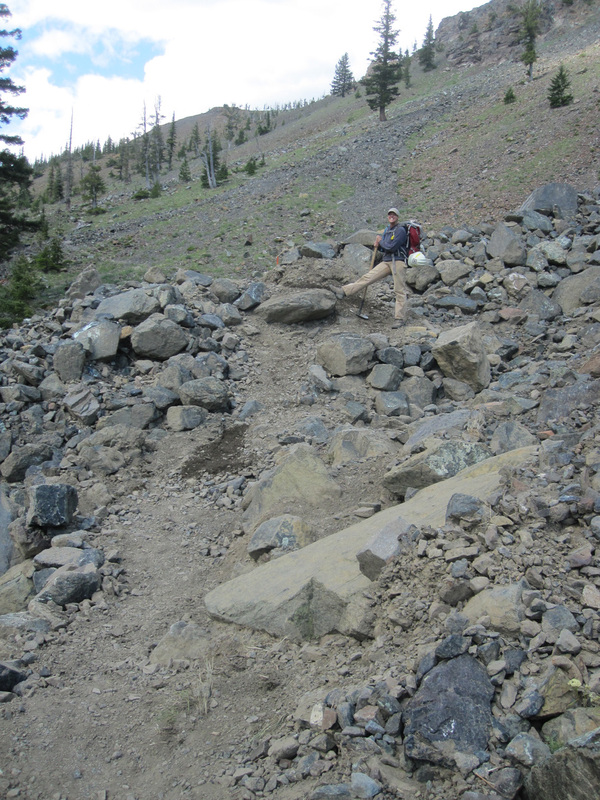 The most impressive change was a big wall of rocks on top of the trail along the edge of a new channel. In the photo, you can see the top of Sam’s hard hat where she surveys the work ahead of us. At the bottom of the photo, you can see where the trail disappears. We worked all day on 100 feet of tread. Boulders were pried out and moved. I filled the gully with rockwork to support new tread. We dug. We sweated. When you’re hot and tired and no cognitive ability remains, brute strength and sheer stubbornness is all you have left. When that fails, it’s time to go lie in the shade for ten minutes until you can rally for another try. It’s not perfect, and it’s not that pretty. But it’s passable. A horse could walk over it without lunging or breaking a leg. Where we dug into the Great Wall of Rocks, the fine soil is still wet. There’s still mud buried in the flow, a reminder that this just happened and that the Teanaway is geologically active. We think of mountains as stable and unchanging. But they are in motion all the time and we only notice when something drastic occurs. What seems drastic from a human perspective is just part of the big scheme of things. I walked across the slope above the trail, and crossed over other ridges of deposited rocks now covered with wildflowers. Grasshoppers jumped away from my feet, and fluffy white clouds sailed east through the blue sky. Mountains have moved before, and sure enough they will move again.